So much goes into coordinating a move from one residence to the next that the little things like the protocol for tipping moving crews gets lost in the chaos. We are here to help with any anxiety you might have regarding tipping in the moving industry. Moving in San Francisco is time-consuming and difficult, and movers greatly reduce the amount of physical pain and anxiety you might feel while transitioning to a new residence. A moving company hires expert movers, and those experts move people on a daily basis, while the average person moves once every seven years. Therefore, moving crews understand how to wrap furniture properly to reduce the risk of damage. They have professional moving equipment that safely moves belongings through doors and up-and-down tricky stairwells and staircases. They pack trucks in an efficient manner, organizing the furnishings tightly, so they arrive undamaged. Reputable movers in San Francisco have a strict policy against asking for tips from their clients; therefore, tipping is voluntary. However, while there are some exceptions, most moving experts agree that tipping is an established and essential practice in the moving industry. It is typical for a client to tip 15 to 20 percent of the total moving company cost in a metropolitan area like San Francisco. Statistics accumulated by T.J. Peterson, a digital marketing manager for Oz Moving & Storage told Fox News that 39 percent of people who hire movers tip 10 percent of the total cost of the move, 22 percent of movers tip 20 percent. Lior Rachmany, CEO of Dumbo Moving + Storage, told realtor.com that moving crews deserve a 20 percent tip for every move. 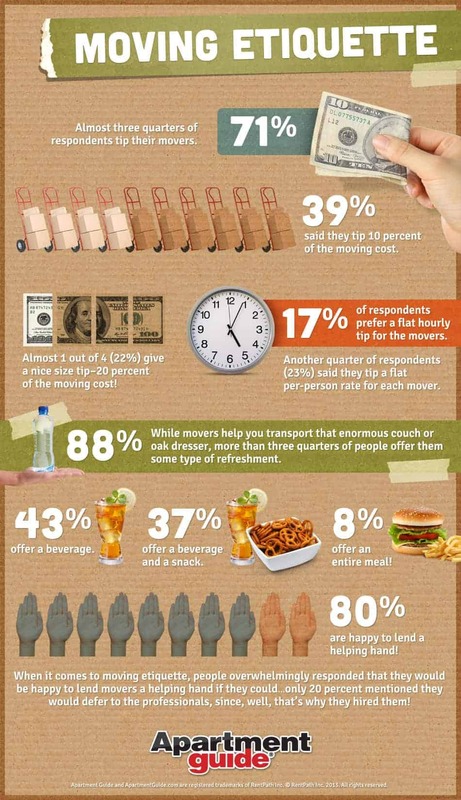 Another survey conducted by apartmentguide.com found that 75 percent of responders tipped their moving crew. Though 71 percent of participants said they tipped, the amounts varied. One out of every four said they tipped 20 percent, 39 percent of the responders said they tipped 10 percent. The remaining participants tip by the hour or tip a flat fee. 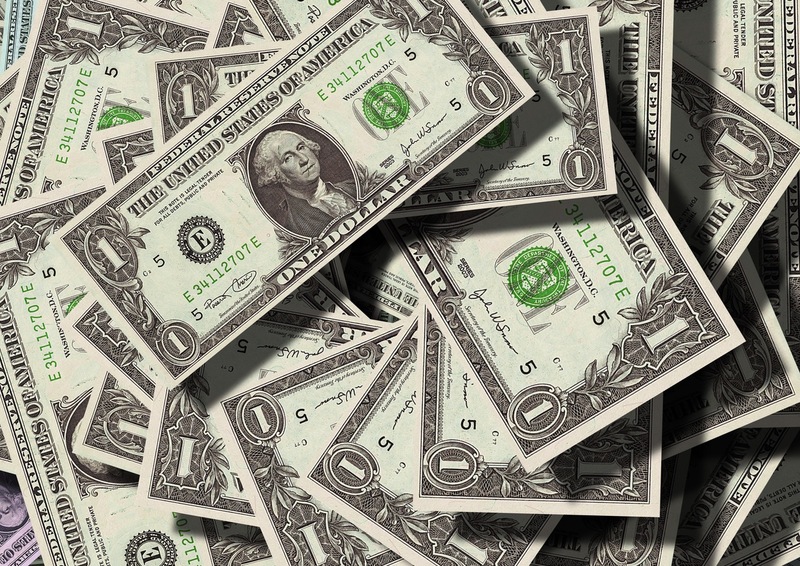 Movers often choose to tip each mover a certain amount of money per hour. These people typically give each mover a tip of $5 per mover per hour for an adequate and efficient move. For superior jobs that involve strenuous lifting, carrying, and placing, movers might receive up to $10 per person per hour. Lauri Ward, founder of redecorate.com, who provides relocation services, told “Today” that she prefers the flat fee approach. You can assess whether your move is complex or not by considering all the factors involved. Consider the length of time it takes the movers to get from your old residence to the new one, and the stairs or elevators the movers must negotiate during the move. In addition, factor the number of large items you are moving, and the overall amount of items you are moving. The weather conditions and the impact it has on the move and the movers should be considered as well. A move in San Francisco is decidedly more difficult for movers than it is in other cities. Finding a place to park is not easy and sometimes parking is non-existent in some areas. The hills and street inclines are also a burden for movers in some areas. 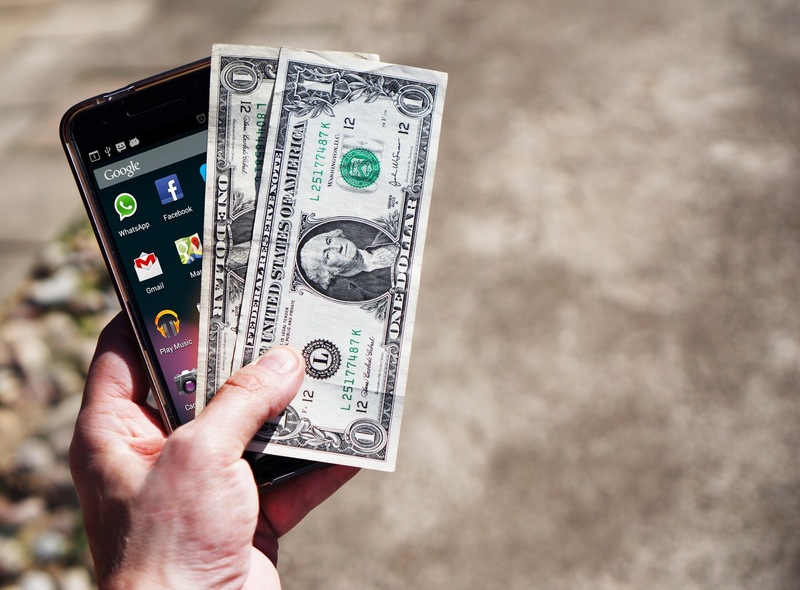 In addition, the cost of living in San Francisco is higher than most cities, so consider that as well, when considering flat-fee or hourly tipping averages across the country. You can give individual tips to each team member, or give the total tip for the entire team to the crew leader. The crew leader is obligated to share the team’s tip equally, and not splitting the tip is a serious offense that could lead to chief’s termination. Typically, you tip the crew at the end of the move, after you sign the final moving paperwork, and the movers have done an efficient job. Often, there is a “gratuity” item line on the final bill, so you can pay the tip and the service fee by credit card. If the movers were uninspired, treating furnishings and other valuables in deliberately careless ways then there is no obligation to tip them. If there is extensive damage, if the crew is rude and unprofessional, by no means are you required to tip the moving crew. As with any profession, tipping is only a reward for work that is well done. Performance is the key, so consider speed, efficiency, quality, care, and politeness. Significant research on moving companies should be done before you hire one. You should verify that the moving company has proper insurance in case the moving crew damages or loses furnishings or other valuables during the move. Also, moving companies should background-check and drug-test their moving crews. In addition, moving companies cannot transport hazardous materials that include ammunition, and flammables like paint, propane, and gas. This means that gas grills and lawn mowers might be an issue when it is time to move. Check with the movers on such items. Finally, moving companies often charge extra if there are impediments to assessing the new residence like stairs, elevators, and abnormal distances from parking areas to your old or new home. “The number one mistake is not being picky with your mover,” moving expert and author Manuela Irwin told Forbes. “Check [their] license with the Federal Motor Carrier Safety Administration, and reputation online as well. Do not sign incomplete paperwork and acquaint yourself with all accessorial charges [that] may incur upon delivery. Transitioning to a new residence requires you to transfer utilities, decorate the residence, replace outdated appliances and fixtures, paint rooms, assemble and re-assemble furniture, and organize belongings. These are all time-consuming and stressful tasks, so organizing and moving your belongings by yourself with family and friends will add frustration and anxiety to the stresses of moving to a new residence. A San Francisco Moving Permit is required to park moving trucks on the street, and the moving company does not acquire the permit. It is your obligation to apply and pay for the permit if parking is limited outside your new or old residence. In order to apply, a person must know the size of the moving truck and how much space the truck requires. Permits are acquired through the San Francisco Municipal Transit Authority (SFMTA). The moving permit process takes at least five days, so obtain it early, or it may not be received by your move date. You should schedule a moving company a month before the move date to ensure a reputable mover is available. Once you have scheduled a mover, begin packing items in advance of the move. Sort and label moving boxes, so that movers know where to place items in the new homes. A move no longer requires an assortment of boxes, and packing supplies and tools. There is now an eco-friendly approach, which also saves time and money. In addition, if you use this green approach, there is no longer an issue with finding cardboard boxes, which might fall apart during the move, or purchasing and assembling boxes, which are a burden to dispose of upon completion. The solution for San Francisco residents is to rent plastic moving boxes from ZippGo, which saves time and money, and reduces anxiety. 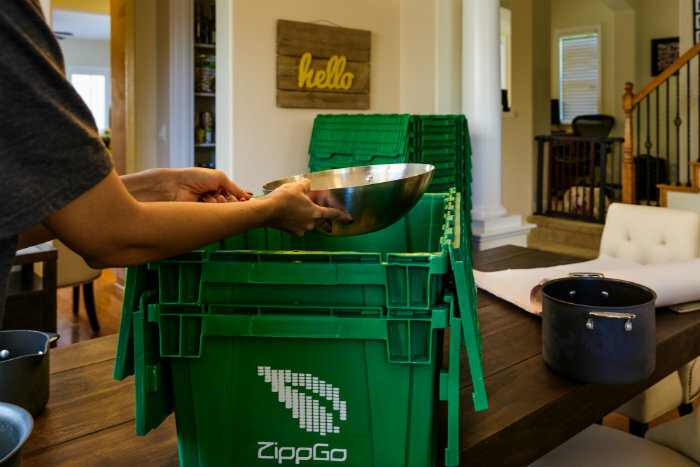 This environmentally-friendly approach to moving boxes is affordable, and ZippGo delivers the boxes and other moving supplies to the your door with free, next-day delivery. There is no need to hunt for boxes, or buy and build them. There is no need for tape because the boxes have integrated locking lids. And, at the end of the move, ZippGo picks up the boxes, which reduces waste and time disposing of them. The containers are crush-proof and waterproof. They stack neatly without collapsing, taking up less room in the house and less room on the moving truck. The move will go quicker, and you will save money in the end. When you begin packing items for the move to your new home, you should pack items in your storage areas first. Items that are rarely if ever used, and have no sentimental value, should be the first items that you box. Next, pack up the rooms that you do not use on a daily basis, which might include a guest room or a rarely used bathroom. Lastly, pack items that you use every day. These everyday items include things in your kitchen, personal bathroom, and bedroom. In the future, tipping may disappear altogether, Jonathon Deesing, community specialist at iMove, told realtor.com. Many large, national moving companies already ask their customers to “not tip” their movers. The competition of larger moving companies, who have a “no tip” policy, might force smaller, local companies to follow their lead, which would reduce margins across the board, and put some smaller movers out of business. In addition to tipping, many customers keep their movers motivated by supplying them with cold drinks and snacks, or even a meal if the move occurs through a typical mealtime. However, providing drinks and food to movers is not considered a tip. In the end, if you are unsure whether to tip, ask the moving company about their tipping policy. If the company says it isn’t an obligation, but it is appreciated, then tip according to the level of service provided by the moving crew.